The best wok? Well The Independent thinks so. In a review of the 12 best woks, the Netherton Foundry 13" wok came out as their "best buy". 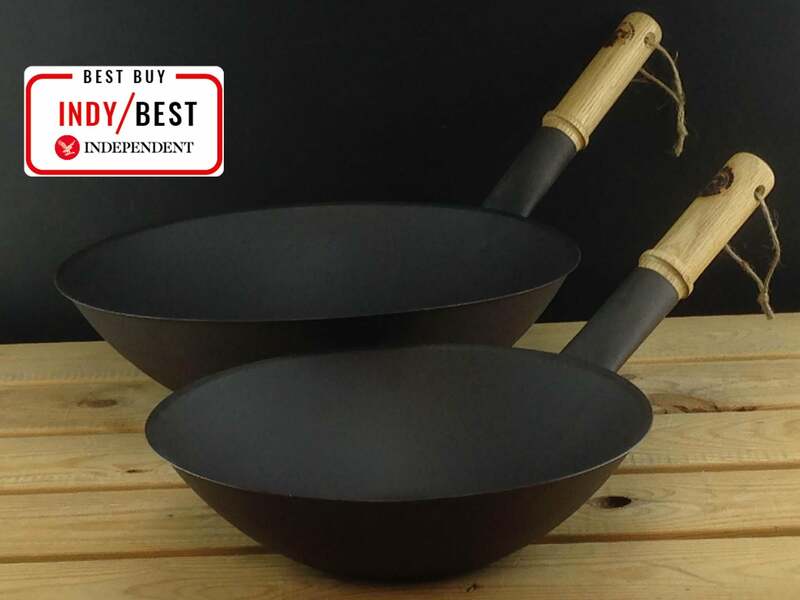 "Suitable for all hobs, this excellent flat-bottomed wok from British cookware producers Netherton Foundry was a unanimous favourite." If you want to see the rest of their review and what they thought of the other 11, you can read it all here: Suitable for all hobs, this excellent flat-bottomed wok from British cookware producers Netherton Foundry was a unanimous favourite. A good wok means dinner is on the table in a matter of minutes. But should you go round or flat-bottomed? Non-stick or untreated carbon steel? Purists may say only round-bottomed woks are allowed, but they’re only suitable to high-powered gas flames so anyone with an induction, halogen or electric hob misses out on the fun. If you’ve got gas, go for a round-bottomed wok with a single long handle, as the pan will heat quicker, food moves freely and you can toss the ingredients over a hot flame. Flat-bottomed woks suit all other hobs, are more stable, and will still make a tasty dinner. Most often used for stir-fries, woks are actually incredibly versatile and should also be pulled out the cupboard to deep-fry, steam, poach, toast nuts, or even try home smoking. If you regularly cook for four people, get a large wok about 30cm or more. Bigger is always better, as it avoids overcrowding ingredients and steaming rather than frying them. Woks are either carbon steel, spun or cast iron, or forged aluminium. The carbon steel variety heat quickly, but spun iron and forged aluminium heat more evenly. If you want something light, hot and nimble go for carbon steel or spun iron, and if you want a robust kitchen workhorse, try forged aluminium. These versatile pans either have a non-stick coating, or are untreated carbon steel or iron. Non-stick woks are low maintenance and good for hectic households, but they won’t last forever, as the coating can scratch or wear out. They can’t stand high heat like uncoated carbon steel and iron, and you must use plastic utensils. Pick PFOA-free non-stick coatings where possible. Non-treated carbon steel woks require seasoning before use, but if you’ve got 20 minutes and a decent extractor fan it’s worth it for the satisfaction and improved natural non-stick, or patina, that develops with every meal. That said, non-stick woks also require conditioning with oil on first use, so all woks need a little extra care to keep them in top condition. With this in mind, our panel tested each wok with two stir-fries (meat and veg) and egg-fried rice, and judged the wok against criteria for heat, ease of use, and end results on the food.